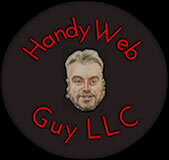 The Team - Handy Web Guy LLC "At Your Service" - Custom Web Platforms Built Just For YOU! Percival Stirling Aka “The Handy Web Guy LLC” is a highly skilled web developer and web services provider with over 16 years of self-employment experience. He gives very close-in client support and guidance with the goal of ensuring that his clients grow their business and revenue with a top-quality web platform. His services range from “A to Z” providing critical functions such as domain registration /transfer /renewals, website hosting, dedicated server operations, back-end PHP / MYSQL coding, fully mobile responsive design, website / content reformatting and cleanup, E-commerce, SSL certificates, SEO operations, anti-fraud and anti-virus /malware and merchant accounts/ payment gateways setup. The websites he designs are custom built and branded and do not have the “cookie cutter” / generic appearance. He has also rescued many client domains from undesired registrars, missing, unreachable, unreliable or fraudulent former web designers / service providers. His clients have ranged in diversity from small and medium businesses, non-profits, foundations, artists, restaurants and professional services and miscellaneous services. He has worked with Rainier Valley Community Development Fund, Aurora Merchants, Fremont and Rainier Chambers of commerce, Garneau-Nicon Foundation, SeaBeez Ethnic Media, Kaosamai Thai Restaurant, Transformational Medicine clinics of Arizona, Juniper Pediatric clinics of Oregon, Royal Esquire Club and many others. He was also active in the Fremont and Rainier Chambers of commerce, being a board member / co-vice president and board member of Rainier Chamber from 2010 to 2012 and a Secretary and board member of Fremont Chamber from 2009 to 2012. He is currently an Ambassador at TownSquared.Com, a local networking service. He has accumulated many positive reviews from current and former clients on Yelp, Linked-In and Facebook and has a very high client satisfaction rate. He also runs a self-employment resource / support center “No Job Like Your Own” and a health foundation “Carr Wellness Foundation”, after putting a case of Diabetes 2 into remission in 2013 with natural methods. Clare is a highly seasoned graphic designer and marketing professional with over 20 years experience. She holds a BA in graphic design from Kent State University. Clare is skilled at developing compelling marketing messages and visual concepts which effectively communicate a client’s desired message to a target audience and industry. Clare has extensive experience designing and managing complex marketing campaigns with components including direct mail, signage, web, email and social media. Clare has completed design projects for a wide array of small businesses and larger clients in a variety of industries, including Microsoft, King County, Intermec Corporation, the Trust for Public Land, and many others. Clare has experience working within in-house marketing departments for Salal Credit Union, the University of Phoenix, and the U.S. military. Kiyan Fox Smith, Coding Developer / Project Manager. I am an independent contractor specializing in doing front end WordPress design and development, graphic design, and project management. My tools are XHTML, CSS, Adobe Creative Suite, WordPress customization, Mailchimp consultant for the #1 mailchimp consulting company in the world (at the time), and Volusion & 3d Cart e-commerce. Web design production for small commercial websites include evolveseattle.com, bootylandkids.com (custom volusion site), cabiri.org, dynamictransitionsllp.com, highlowvintage.com, jadeinstitutenews.com, various email templates, and oncoremusic.com (a northwest cover band). Contracted for web maintenance with the Washington Area Health Education and did graphics editing for Memory Lane (used to be Classmates.com). Prior to that did a total of over four years as a jewelry buyer and returns project manager at Amazon.com. Julie is my wife of 18+ years and a crucial part of the Handy Web Guy LLC team. She is our accountant, organizer and our "Get Things Done" person. Besides keeping all the working pieces of Handy Web Guy LLC going and together, she has also worked for the FDA, Bothell Office for over 25 years as it's mail and filing manager.